With Washington, D.C., talking Israeli politics, National Review Online asked experts: "Going into a presidential-election year, what's a sane, responsible Israel policy?" For the responses of the other eight respondents, click here. Two premises shape my preferred U.S. policy toward Israel. Negatively, the two countries have the same enemies and suffer from the same problems coming out of the Middle East, notably WMD, wars, terrorism, piracy, anarchy, tyranny, refugees, drug trafficking, counterfeiting, oil and gas disruptions, extremist ideologies, conspiracy theories, etc. More than that: they share enemies. Anti-Americanism and anti-Zionism are first cousins, with one usually leading to the other. 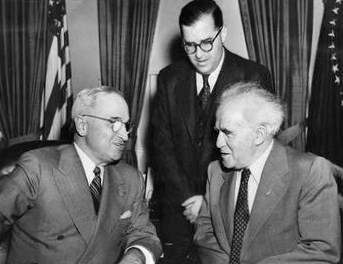 Truman and Ben Gurion, with Abba Eban between them: Where it all began. Positively, judging by such criteria as United Nations votes, bilateral commerce, intelligence cooperation, military alliance, intellectual influence, religious bonds, shared values, the U.S.-Israel bond is arguably the closest international tie in the world, making it what I call "the family relationship of international politics." One revealing symptom: the two states can barely restrain themselves from interfering in each other's affairs. Together, these negatives and positives point to a self-evident policy conclusion: cooperate, seek synergy, work toward shared goals. Contra Obama, avoid daylight between the leaderships. Deal with differences quietly and effectively. Announce to all that the two governments agree on fundamentals and will not be divided.